Applying for college can be a complicated task. Students and parents alike may find themselves bombarded with conflicting information while wondering what to do. Truthfully, though, getting admitted to a top school does not need to be painful or confusing. In this article, we explore the 9 Biggest Myths of Ivy League Admissions. We hope that this information can help clear some of the confusion that accompanies seeking admission to an Ivy League college. If your high school student is preparing to apply to an Ivy League school, then you have probably heard about the necessity of having a “well-rounded” application. Students must demonstrate excellence in all subjects by taking every available AP class, as well as display a variety of different interests by participating in many extracurricular activities. In theory, this makes sense because well-rounded students make well-rounded citizens, right? In reality, the top colleges are not looking for balanced students, but rather balanced classes. They want classes that are diverse and balanced with specialists in many different areas. So Ivy League schools looking for students who are very good at a few things and it’s hard to be the best at something when you are distracted by being good at everything. This compulsion to be well-balanced is driven by a fear of failure that is commonly seen in high-achieving students. These students believe that a top college will not accept someone who is only good at math and science and has not completed the honors track in the humanities as well. Similarly, these students believe that all top colleges want to see participation in student government, honors societies, varsity athletics, and community activities. In reality, though, colleges are interested in seeing a student who is highly committed to a single discipline and has taken every available measure to build expertise in that discipline. The IvyZen approach is all about bringing the student’s interest and talent together in a single unified theme, as discussed in our Theme article. Ivy League schools are searching for students with demonstrated interest, and to build a strong resume in a single subject, students must forfeit the idea of being well-rounded. If the student’s theme is Cultural Anthropology, then it is probably time to give up that AP Calculus class and in favor of extra history classes. If the student’s theme is Computational Biology, then it is probably time to give up that seat on the student council and instead seek an internship or draft a research paper. Ultimately, those who make history are not well-rounded people. Is Einstein known for his leadership abilities? Is Malala known for her AP Physics skills? Is Zuckerberg known for his poetic prowess? Ivy League colleges are looking to produce the future leaders of the world in all disciplines, and in order to fit into this scheme, a student should strive to be the most special rather than the most balanced. 76% applied with a GPA of 4.0 or higher -> but that also means 24% didn’t have a perfect GPA! Only 18% of applicants achieved a perfect score of 800 on the SAT Math section, and of those applicants, only 9% were accepted. Clearly Stanford is not looking for perfect scores. Shoot for a good enough GPA and test scores and spend the rest of your time on strong activities. Furthermore, consider that in America, there are around 40,000 high schools, which means there are around 40,000 valedictorians every year trying to clench the few coveted spots in the Ivy Leagues. Here’s the reality: If your student is applying to an Ivy League school, perfect grades and high test scores are not an achievement. They are the standard. Every year, we hear about students who are flabbergasted by rejection letters from not just one but all top colleges that they applied to. These students worked hard to achieve perfect GPAs and have frequently earned not high, but PERFECT test scores: 2400 SAT or 36 ACT. Students have grown up under the impression that a perfect test score is the golden ticket to a top college, but these schools are so competitive that nearly every applicant demonstrates these academic achievements. A better approach is to aim for numbers that are good enough and focus more on developing a unique and compelling theme; in other words, focus on a student’s strengths and foster an interest in honing them. For example, if a student has an interest in engineering and a talent for math and science, then there is no reason to put his GPA at unnecessary risk by enrolling in AP English, AP French, and an art elective. Students should instead use that extra time and energy to participate in an engineering project or work on an engineering research paper. That’s what they’re there for, right? Almost every high school has a department dedicated to making sure that students reach their maximum potential. These counselors will ensure that the student excels by placing him in the correct class, motivating him to succeed, and addressing any issues that come up. As long as a student listens to his counselor, he or she will go to the best possible college, right? Not exactly. To clarify, it would be unfair to suggest that counselors do not care about the individual student. Certainly a love of helping others succeed drove them to choose this career. However, it is also unfair to expect that a counselor will be able to do the work for your student and it is unfair to rely on the advice of the counselor alone. Consider the fact that at an average American high school, each counselor has literally hundreds of students to advise from freshman to senior year. Now, consider the types of advice that each type of student needs. Will one counselor be able to help a student pick a theme, select several colleges, advise on class selections, and oversee the essay writing process? Obviously not. And keep in mind that the student would have to be incredibly proactive about visiting his counselor in order to receive even a fraction of that assistance. Additionally, a single counselor cannot be an expert in all things or all colleges (no one can). Therefore, students and parents should be proactive in seeking the help of experts to facilitate the college application process. The simple truth is that a counselor will never have the opportunity to know a student as well as a parent does or as a well as a student knows himself. Students who are interested in applying to top colleges need to assume responsibility for their own success. This responsibility includes preparing early, doing plenty of research, and accepting that the student’s fate largely depends on the student—not the teacher, counselor, or school. Counselors can be helpful in many ways, the most important of which is resources. An average high school counseling office has access to information about almost every school and will frequently offer college visits with recruiters, financial aid workshops, and even college application workshops. If a student can benefit from any of these opportunities, though, it is one hundred percent up to the student to seek these things and stop expecting a counselor to do the work. When filling out college applications, especially for Ivy League admissions, this should be your mantra: “Quality, not quantity.” This is certainly the sentiment among top colleges, and this trend is growing every year. Consider the Common App as an example. In the past, the Common App allowed students a maximum of 20 activities on their applications, perhaps with the idea that students would not be compelled to fill everything in, but that a handful of students may have participated in a lot of activities. However, it soon became clear that students felt obligated to fill in all 20 items and were stretching the legitimacy of some of these activities. In response, the Common App restricted the list to 15 items, then again to ten. The Common App is not the only place in which applicants are limited. In fact, MIT admissions only allow students to write four activities on their application, regardless of how many they participated in. Quality, not quantity. Top colleges are interested in seeing depth of interest in each student’s extracurricular activities. They pay a lot of attention to how many years you participated and what leadership positions you held there. They also want you to write lots of essay content on them. One of the most popular essay topics is one where they ask you to discuss in 150 word one activity that is the most meaningful to you. However, let’s ignore our mantra for a minute and consider the difference in the quantity and quality approaches. Let’s pretend for a moment, that there are two students, A and B. Both students are applying to the Harvard biology department with the hopes of pursuing pre-medicine, and both are asked to write a list of extracurricular activities. Student A decides to go with the quantity approach and begins to craft his list: student council member, first chair clarinet player in concert band, second chair clarinet in marching band, volleyball team, soccer team manager, science club, participant in science competition, volunteer who helps the elderly with taxes, yearbook committee, spirit squad member, and the list goes on and on. Student B, on the other hand, attempts the quality approach and makes sure that these activities demonstrate her interest in pre-medicine. Her list includes only five items: Intern at local hospital research facility, co-author of biology research paper, volunteer at local clinic, president of the biology club, and designer of a mobile application that reminds new parents of immunization schedules. If you were the Harvard admissions officer and it was your job to choose pre-medicine students, which student would you choose? Student A’s activities show a committed interest to involvement with his school, but they fail to show and interest in pre-medicine. Student B, though, has shown that she has considered her major and career choice carefully by selecting activities that support her goals. Regardless of the reality of the situation, Student B appears to be the more dedicated student and is more likely to be offered admission, given identical grades and test scores as Student A. It simply takes too much time to participate fully in more than a few activities, and Ivy League colleges recognize this. Students are much better off showing committed involvement to a few activities than many. The application will likely only ask for the top five anyway, so why spend time on anything else? Quality, not quantity. Download our free Success Stories pdf for 6 success stories (with full student profiles) of students who gained admissions to Columbia, MIT, Caltech, Dartmouth and more! Many students are under the impression that their odds of admission are higher if they apply to a large department with a conventional major, e.g. econ, premed. Their reasoning is that a larger department means more open spots, which means a higher likelihood of admission. However, this is not always the case. Ivy Leagues and other top colleges are frequently devising new majors to keep up with the changing world, and actively attempting to generate interest in these majors. Unfortunately, many students overlook these majors in favor of pursuing something more general, and as such, admission spots for these majors can be difficult to fill. It can be to a student’s advantage to apply for a unique major as a first choice and design a theme that appeals to this major. Consider Stanford University admissions as an example, where it has lately become notoriously difficult to gain admission and acceptance rates have been hovering around 5%, as mentioned earlier. However, Stanford recently started offering a major called Art Practice and Computer Science. Since this is a new major, few students have heard of it. To apply as an Art Practice and Computer Science major, rather than Art or Computer Science alone, can present a significant admissions advantage to a savvy student. Additionally, the hard sciences are receiving a particular overhaul at top colleges in order to keep up with rapid technological advances. Stanford now offers majors in Bioengineering, Biomechanical Engineering, and Biomedical Computation in addition to the standard hard sciences. By choosing to apply for one of these majors rather than a simple Biology major, students may increase their odds of admission. Stanford is not the only school offering new majors. Princeton University offers majors in Operational Research and Financial Engineering, and Yale offers a major in Computing and the Arts. As with Stanford, designing a theme around these unique fields of study then applying for these majors could give students a powerful edge in the admissions pool. Advantages of choosing a “new major” do not stop with admissions. In fact, new departments or new majors mean access to small class sizes and personalized attention from committed and specialized professors, compared to a more general major, where you might find yourself in an auditorium with dozens or even a couple hundred students. Furthermore, new majors can lead to more fruitful “in-demand” careers. Colleges create new majors in response to a limited supply and a high demand. A student who chooses to graduate with a new major will be among the first in their field, which generally leads to higher pay and greater opportunities. A degree in Biology from Stanford University will certainly open many doors. However, a degree in Biomedical Computation from Stanford University will open many specific doors, since there is clearly a demand for such specialized skill and knowledge. When it comes to recommendation letters, there are two common assumptions that even the best students can make, and both of these assumptions are bad ones. First, it is a mistake to believe that a teacher owes you a recommendation or will simply give the student a great recommendation if he or she simply asks. And two, it is a mistake to assume that a teacher will offer to write a recommendation without prompting from the student. On the other side of the coin, a teacher will never know that a student wants a recommendation letter unless he or she asks the teacher. When asking a teacher for a recommendation, a student should consider ways to simplify this process. First, the student should always allow the teacher plenty of time to complete the recommendation letter, and be sure to offer the occasional reminder. Second, the student should be clear with the teacher about what they would like mentioned in the letter or if there are any special requirements for content. At minimum, the teacher should know the nature of the student’s career ambitions and choice of major. The best recommendation letters are heartfelt and well-informed, cultivated by years of academic interaction between a teacher and a student. Any student seeking Ivy League admissions should take early efforts to form and foster the appropriate connections. 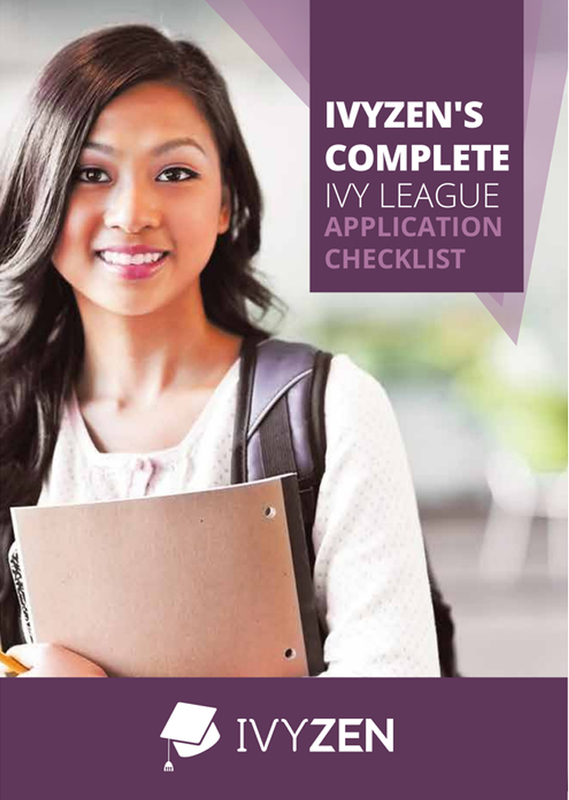 At IvyZen, we guide our students through a systematic recommendation process, which begins with preparing a resume, a college list, a summary of thematic elements like extracurricular activities, and an intended major. Students then take this resume to their teachers in the spring of their junior year and use that opportunity to ask for recommendation letters. After the summer, when the student has finished writing the rough drafts of all the essays, the student will give these drafts to the teachers. This serves to gently remind the teachers to write awesome recommendation letters for the students. Providing all this material does three things. First, its shows that the student is taking responsibility for his or her college applications. Second, it provides the teacher with focused, informative content about the student, so the teacher can be sure to write a personal and informed letter. And third, it encourages the teachers in a positive and natural way to write great recommendation letters for the student. Ivy League college admissions officers do enjoy seeing students who are legitimately committed to bettering society and have a demonstrated history of community involvement. However, the notion of community service has become so overused and abused that it is almost impossible to discern those who have an interest in community service from those who are “doing it to get into college.” Most high schools offer a plethora of community service opportunities; some require them to graduate. Because so many students have community service activities on their application, it has lost its uniqueness. A good rule of thumb is that if the community service applies to a student’s unique theme, e.g. political activism or social entrepreneurship, then it should be included in the application. On the flipside, if the activity is one that is very popular you should be suspicious. Choose one that will provide a unique way for you to contribute in a compelling way. For example, consider political activism, like getting involved with local politics or petitioning for a certain cause related to the theme. When a student chooses to participate in a particular cause, the doors open up for organizing fundraisers, marches, petitions, and informational seminars, all of which provide great material for admissions essays. If a student is not interested in a political cause, then the student could think about ways to involve others in their theme. For example, if the student’s theme is Art as Therapy, then the student could organize an art class for local seniors suffering from loneliness. As long as the student is able to commit to many hours of legitimately bettering the community in a way that is related to his or her theme, it may be included in the application. However, any community service that’s sole purpose is to provide fodder for the application should be avoided. For the past few decades, colleges around the county have played host to thousands of high school students who gather to take classes, listen to lectures, and live in the dormitories, just as a college student would. These programs can run parents thousands or even tens of thousands of dollars, but these expenses are expected to be worth it if it gives their son or daughter a competitive edge when they apply to that school a year or two down the line. However, this is based on the assumption that attending these programs will help the student get admitted. In truth though, they won’t. Regardless of what school or program a student attends, doing so will not affect admission to said school. There are several reasons for this. First of all, many of the programs offered at Ivy League colleges are not offered by the Ivy League college, but rather contracted to an outside firm. In other words, while the class is being held in a Yale classroom, the instructors and materials are not affiliated with Yale, and thus Yale admissions officers do not care. This is not to say that these programs aren’t valuable. In fact, there are a handful of summer programs that are very helpful and, at IvyZen, we help students prepare for these. In the STEM areas, good summer programs include PROMYS, RSI, SuMAC and the Ross Mathematics Program. For creative writing, we highly recommend the Iowa Young Writers’ Studio and The Kenyon Review Young Writers Workshop. All of these programs are highly competitive and require a lot of preparation beforehand. Compared to the special Ivy League hosted summer camps, these prestigious workshops are much more likely to help in the admissions process. Most students are better off spending the summer months (and all that money) on an internship, a research paper, a project, one of the above listed camps, or some sort of community activism. Almost anyone can go to an Ivy League campus and take a class if they have enough money. Not everyone has the discipline and the know-how to spend their summer productively contributing to their themes, which is what Ivy League admissions officers really want to see.